Are you bored of your humdrum life and need a thrilling change today? Let’s get yourself a skateboard and cruise on the smooth and rough land in your town. It’s an exciting activity that gives freedom to move and allows riders to enjoy the fresh life in the city every day. But to do that, you first need to pick a perfect skateboard. 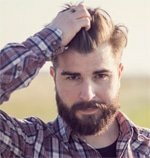 Here I will help you choose a right skateboard for cruising while considering different aspects such as price and quality. When it comes to land cruising, the skateboard has to be picked very carefully. Unlike other sports, skateboarding is all about right equipment. It’s true that practice and learning are essential, but if your skateboard is right for cruising, you cannot even learn it. Thereby, never take skateboard purchase easy and consider every single factor to end up paying for the right piece. To cut a long story short, a rider’s skills get polished when he steps on a perfect skateboard while on the other hand, if the board is not a good choice, money is wasted and performance drops! To choose a right deck for cruising, don’t forget to find the width. Usually, the width of skateboard decks lies between 7.5” to 8.7”. There is no single ideal width of cruiser decks as it varies according to the riding style and stature of riders. Skaters who need more space for feet to ride comfortably should opt for more extensive decks while those who are more into performing tricks and skating around the street should go for narrower decks. Best cruiser skateboard for beginners is also the one with the small deck as it’s easy to handle and roll. The next thing to consider when choosing a deck is its length. There are different lengths usually range from 28” to 32” and even longer than that. Width and length of decks go hand in hand because shorter boards are usually narrower and longer boards are wider. Once again, it all depends on rider’s height and riding style. Beginners who are still learning how to build control over the deck must go with shorter boards whereas professionals with tall heights know how to roll a longer board hence can go with something even closer to 40”. Every deck has a wheelbase that determines the distance between both sets of wheels. Trucks are installed in the wheelbase holes to attach wheels. Usually, wheelbase ranges from 13” to 15” and is preferred by rider’s height and riding style. Those with tall heights and years of experience should go with broader wheelbase whereas kids and beginners should prefer narrower wheelbase to learn balance. The front end of your deck is called its nose. It is usually thicker and longer than the tail of the deck. The back of a deck is called its tail. It is usually thinner and shorter than the nose and helps in creating balance. The lowered area in a deck is called concave. You must have noticed that nose and tail of most of the decks seem upwards while middle part has a little sunken indentation. This feature allows riders to enjoy more control and balance. Concave in a deck works as a foot holder so you must not fall while performing tricks and cruising on uneven surfaces. A deck with concave is ideal for freestyle cruising as well. After deck, wheels are the next important thing you will be considering to choose a right skateboard. Many people make a mistake of using smaller wheels for more expansive decks and larger wheels for smaller decks. You need to maintain a balance between the size of deck and wheels. Make sure wheels are as big or small as the deck is. Otherwise, your wheels will get bitten now and then during rides and wear off sooner. Wheel size is also responsible for the speed. Larger wheels roll faster because the friction is less whereas smaller wheels face higher surface friction, therefore, move slowly. If you like to cruise on an uneven surface with a lot of hurdles such as sand cruising, opt for larger wheels with right hardness to enjoy perfect rolling. Make sure your weight is also well supported by the size of the wheels. Larger wheels are ideal for heavier skaters whereas kids with lower weight can enjoy smooth rides with smaller wheels. Below is the chart of skateboard wheels for further help. The next part that affects the overall performance of a cruising skateboard are the trucks. They are T shaped metal-made items that are attached to the lower side of a deck. These trucks have a place for wheels on both ends. The primary reason why wheels are not directly connected to the deck is that it makes turning impossible. Trucks allow wheels to turn while rolling. With trucks, cruising becomes smoother as the rider doesn’t take frequent pauses around the corners. When you choose trucks always keep the width of the deck in mind as you don’t want trucks to be visible from both sides. Usually, the standard size of trucks is recommended for cruising while kingpin trucks are ideal for downhill boarding. So, as far you are looking for a cruiser, always opt for the one with standard size trucks that also reduce wheel bite. The next part of a skateboard you need to check is called bearings. Bearings are round metal items that are put inside of wheels to let them mount the axle easily. Bearings come in different sizes depending on the size of wheels and axle. Make sure, the skateboard you are buying has high-quality bearings as they determine the performance of wheels significantly. Bearings are also replaceable and cheap so even if the skateboard is excellent, but bearings are not suitable, buy the board and change the bearings, simple as that! From the Quest brand, here comes an ideal model of a skateboard for beginners as well as professionals. It is offering an excellent combination of high quality, low price, and stylish design to beat the boredom. Its deck has a length of 44” and width of 9 inches. Although it is ideal for average height, riders shorter than 5’6” should prefer something smaller than that. Hardwood maple and artisan bamboo are combined to create a durable deck with perfect concave. It’s a wooden deck and bends very slightly when you step on it. As for the wheels and trucks are concerned, they also function correctly and allow smoother rides and quick turns. Overall, it’s a highly recommended skateboard for cruising due to its suitable features and appreciable performance. Users are pretty satisfied with it! High-quality material is used in its making that makes it durable enough to withstand all sorts of flat surfaces and too much pressure. It comes out of the box in perfect condition, ready to skate. The deck is also more stable and bends only a little to allow more control. Wheels are bearings are not in durable enough and wear out in two to three rides. Here comes another incredible option for cruisers. It is a well-made skateboard by the ZED brand to cater to the needs of beginner and professional cruisers. 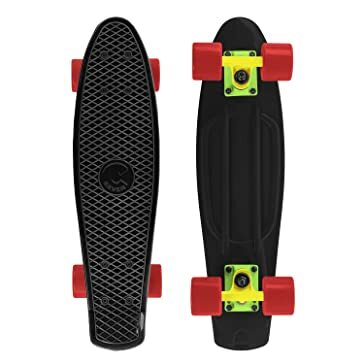 It has a 44 inches long deck that is perfect for riders with average height. The Deck is made from the high-quality combination of Bamboo and Maple wood. This combo results in true durability and right flex. It’s a strong deck with eight ply construction so you may stand with confidence and roll with pleasure. As far as maneuverability is concerned, the making of this skateboard is pretty suitable for performing tricks. The kick-tail shape allows riders to flip over and show their skills to everyone. As trucks are made up of aluminum, they can also bear the pressure of jumps and quick turn over. With this model, you can enjoy flawless street cruising while performing incredible tricks. This skateboard rides pretty well and is a perfect pick for beginners. The quality is excellent, and the price is easily affordable for students as well. It is lightweight hence easy to ride and carry anywhere you want. Wheels don’t spin off much longer and wear off pretty soon. Skatro brand makes this skateboard model. They have implemented their flexy technology to make this incredible cruiser. 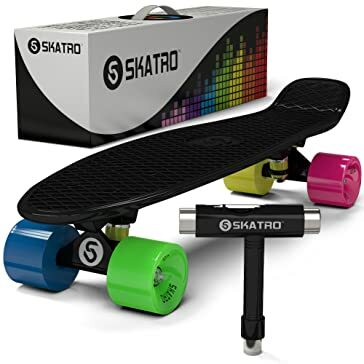 As too much plastic makes a deck extra stiff and too less plastic makes it quite flexible, Skatro manufacturers have used a machine to determine the amount of plastic they should apply in the making of this board. This is the reason; it’s a consistent board that can deal with a certain amount of pressure quickly. Other than deck, bearings, wheels, and trucks are also finely finished with significant consideration. These all parts join together to enhance the rolling of this board. From speed to the rotation, everything is pretty good to enjoy an unforgettable ride. As it’s a mini cruiser so kids and teens will find no better option than this piece to learn their crazy cruising tricks. It’s a durable skateboard made up of high-quality materials. This skateboard is ideal for beginners due to its perfect size and design. The price is also reasonable for such high quality. Deck has flex for maneuverability. Wheels are pretty slippery and wear off sooner than expected. The deck grip is also lower and needs to be improved with grip tape. This is another excellent option for beginners who want to enjoy cruising style. It is a complete skateboard, so no assemblage is required at all. The moment you take it out from the box, you can step on it right away to explore your neighborhood. It’s a perfect model for kids and adults to learn basics of skateboarding. The deck comes in 22” x 5.75” dimensions and is very easy to carry on campus or in shopping malls. High-quality plastic is used to finish the deck, and this is the reason it weighs pretty light and convenient. You can also fit it into your regular backpack as you won’t be able to ride it indoors. Wheels and trucks are also in perfect shape and size allowing riders to roll smoothly in speeds without compromising on ease or comfort. This skateboard feels excellent as it is made up of high-quality materials. The price is too low whereas quality is not compromised at all. It has a compact size hence carrying it around the campus is secure. It’s portable and easily fixes in bag packs and luggage bags. It has such poor bearings that you will need to replace them right after the first ride to enjoy safe cruising. 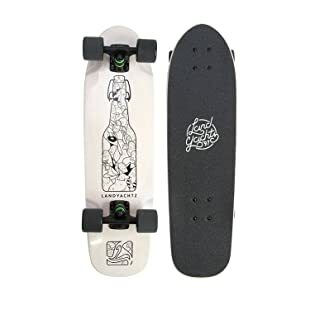 This model is introduced by UK’s well-renowned skateboard brand ‘Ridge Skateboards.’ It’s available in USA, UK and many other countries in Europe to cater to the needs of skaters. There is no doubt that this model is widely appreciated as an ideal cruiser for beginners. From kids to adults, everybody can get it to explore the fun and excitement of street cruising. 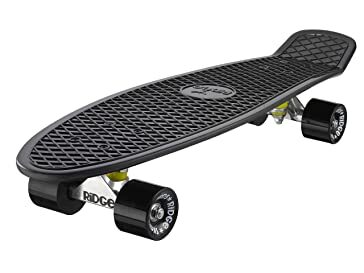 Comparing to other Ridge models, this mini cruiser is 5” longer and 1.5” wider. The length of the deck is 27,” and width is 7.5” allowing riders to enjoy more grip on the board. It’s very much stable and allows more control to the rider. Wheels are made from PU material and come in 59mm 78A size that is ideal for cruising. Overall, the design is excellent, and making is top notch so spending your money on this model is not a bad idea at all! It is a high-quality skateboard and perfect for beginners who want to learn cruising style. The price is also pretty low and easily affordable for students as well. The deck is also more stable and offers better control to the riders. Wheels don’t roll as good as expected and bearings are not in good condition as well. Here comes the best option for all thrill and adventure seekers. With this mini deck board, you can explore most of the skateboarding techniques. Light in weight, the board is pretty easy to carry to places like college and nearby parks. You can also put it in your bag pack and be always ready to skate. High-quality components are assembled to make it a complete product of fun and enthusiasm. As far as, durability is concerned, seven-ply Maple make its deck that doesn’t only offer long-lasting usage but also make it more flexible and maneuver friendly. Overall, it’s an excellent option for all riders from beginners to professionals who want to enjoy the best of skateboarding! Its compact size makes it fit in any regular backpack. The wheels wear off soon. It’s not suitable for heavyweight people due to its compact size.